Lens trickery gives wearers the awesome power to make 3D movie effects go away. Picture the scene: You're planning a trip to the movies with a group of friends and they want to go see some big Hollywood blockbuster in 3D. Unfortunately, you're not keen on 3D movies because they give you headaches. Ordinarily, this would be a tricky problem to solve, but with a pair of 2D glasses, you can enjoy the same movie as your friends without going home with a migraine. The 2D glasses were created by Hank Green, after he discovered that his wife was one of those people who couldn't watch 3D movies without getting the aforementioned headaches. Not wanting to cause his wife pain, he got out his tools and made the first prototype. They worked like a charm, and he very quickly had orders for ten more pairs. Realizing that making the 2D glasses out of parts taken from the movie theater wasn't going to work forever, he decided to invest in getting them made properly. If you're interested in a pair of 2D glasses, you can buy them on Green's site for eight bucks plus shipping. 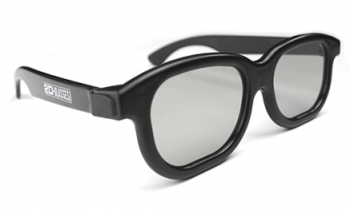 Unless you're friends with a lot of 3D movie buffs you probably won't get a whole lot of use out of them, but it might be handy to have a pair lying around, just in case.